10G SFP+ active and passive direct attach twinax cables. Active cables are copper cables for data transmission. They use silicon (semiconductor) to boost the performance of the cable. On the contrary, a cable without a chip is considered as a “passive cable”. The SFP+ cables support 10G Ethernet, 8G Fibre Channel, 10G FCoE, 10G InfiniBand and various unified architecture link applications. 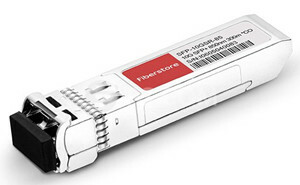 SFP + cable is widely used in the top of the Rock switches and high-performance server for interconnection. Top of the Rock switch power consumption is less than 10GBASE-T ports switch. In the market waiting for more energy efficient 10GBASE-T switch, SFP + cables are more popular for at the Top of the Rock switch. 28 AWG and 24 AWG cables are available for DAC cables. 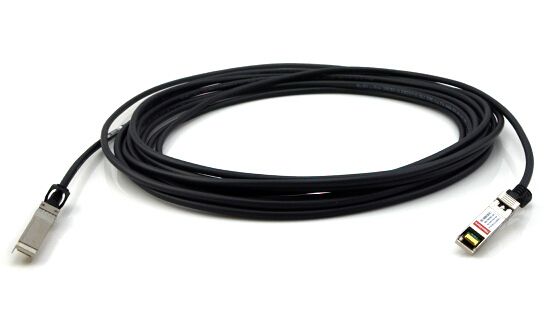 The standard lengths for the sfp+ direct attach cable are 1m, 2m, 3m, 5m, 7m and 10m. Custom lengths are available upon request. 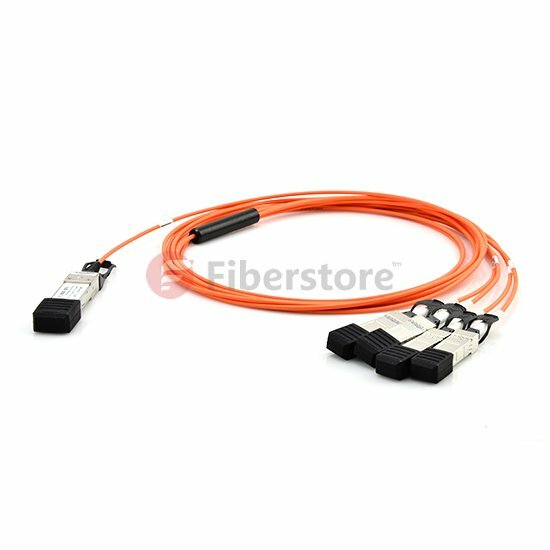 SFP+ fibre cable solution is suitable for longer distance communication, while 10G SFP+ cables solution is best when utilized in short lengths, typically 15m or less, which is sufficient to link server cards and switches. But at present, the fibre and copper cable transmission standard of 10G Ethernet have been launched. However, there is only the fibre standard without copper standard for the 40G Ethernet transmission now. From the perspective of the development of wiring, generally, the standard of copper cable is always behind the fibre standard and the application standard. Currently, the TIA and ISO have already established a working group to carry out the research work of the copper standard. Actually, the QSFP+ cable is a choice for short transmission distance. Generally, QSFP+ cables are used to connect the ToR switches. QSFP+ cables and SFP+ cables are both suitable for the short transmission distance. The fibre can be considered for the long transmission distance. The standard distance of OM3 multi-mode fibre is 100m and the OM4 is 50m. The single-mode fibre will not encounter the problem of transmission distance. FS.COM provides qsfp 4x10g aoc7m. For the high-density, high-performance, longer distance and high-speed and other requirements, the MPO/MTP will be a more reasonable choice. FS.COM is a leading manufacturer in developing and manufacturing advanced optical network solutions to the fibre optic network, CWDM/DWDM system, and Data Centre system. FS.COM always aims accurate lead time and best service with high quality products to customers. Today, FS.COM offer customers a broad range of data Centre networking and communication solutions in following categories: GBIC, SFP, SFP+, XFP, XENPAK, X2, QSFP+ 40G AOC/ACC, 120G CXP AOC/ACC, Ethernet Converter and Fibre Optical Patchcord, Total fibre solution with CWDM, Mux/Demux, Repeater products. This entry was posted in Fiber Optic Transceivers and tagged 10g sfp+ manufacturers, DAC Cable, QSFP+ cable, qsfp+ manufacturers, SFP+ cable on December 12, 2014 by Admin. Today, 10G SFP+ direct attach cable (DAC) becomes cloud computing and cloud storage mainstream primary connection tool, but what is a direct attach cable? For this, different manufacturers of DAC cable have different presentations and descriptions. And here, we’ve got a number of related information together, mainly to discuss what exactly SFP + direct attach cable is and its other details, as well as discuss the advantages and disadvantages between active and passive SFP + DAC cable. What Is 10G SFP+ Direct Attach Cable (DAC)? The 10G SFP+ direct attach cable option is defined for 10G applications over copper cable. The 10G SFP+ DAC link utilises a receive equalizer from the host PHY/SerDes to be able to compensate for the Inter Symbol Interference (ISI) introduced by the cable. Electrical and mechanical specifications for SFP+ optical modules, 10G SFP+ direct attach cable, and hosts are defined in the SFF-8431 specification developed by the SFF Committee, with broad industry participation. 10G SFP+ direct attach cable is made from the inexpensive copper twinaxial cable with SFP+ connectors on both sides based on SFP+ MSA (multi-source agreement). It uses SFP+ connectors for 10G links instead of utilising an optical transceiver on each and every end as well as a length of fibre optic cable. It takes away the expensive optical lasers along with other electronic components. For both active and passive 10G SFP+ DAC cables, a smaller electrical component is used to recognize the SFP+ module and cable type to the Ethernet interface. 10G SFP+ direct attach cable is known as the successor technology to 10GBASE-CX4. It has the advantages of low power, low cost, low latency with the more benefits of having the small form factor of SFP+, and thinner, more flexible cabling compared with 10G SFP+ transceivers. Due to the distance limitation, the target application of 10G SFP+ DAC is interconnection of top-of-rack switches with application servers and storage devices in a rack. Vendors provide both active and passive versions of the 10GSFP+ direct attach cable. 10GSFP+ SFP+ DAC assembly is recognized as active in case there are signal processing electronics in the SFP+ module to increase signal quality and supply a longer cable distance. So the active direct attach cable can make it a possibility to support longer and thinner cable assemblies. The lower priced approach is the passive direct attach cable, which has a tendency to be shorter. Active 10G SFP+ DAC has a 10m distance limitation and passive 10G SFP+ DAC ranges from 1 m to 7 m. But you may discover variations in supported cable lengths among different vendors. Passive 10G SFP+ direct attach cable is much less costly but require the host to do the work of driving it properly. 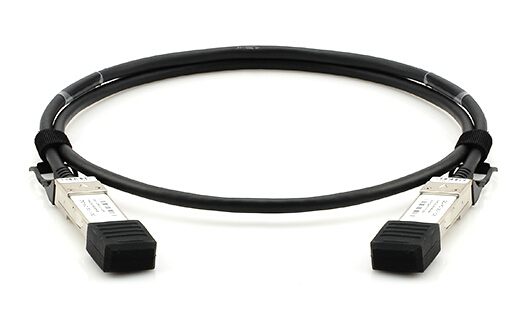 Active 10G SFP+ direct attach cable provides the added benefit of being “optical-module” like. This low-cost 10G SFP+ DAC is beneficial, as an example, for interconnecting a collection of switches, as well as for short-distance connections between switch ports and Ethernet interfaces on servers as well as other devices. Before the growth and development of 10GBASE-T, it was the only real low-cost copper connection designed for 10 Gbps operation. For active and passive 10G SFP+ DAC, each has advantages and disadvantages. You can select according to your special needs. You can also get 10G SFP+ direct attach cable of various compatible brands from here. Related Article: 10GBASE-LRM vs. 10GBASE-LX4, Which One Wins? This entry was posted in Direct Attach Cable, Fiber Optic Transceivers and tagged 10G SFP+ DAC, 10G SFP+ Direct Attach Cable, DAC Cable, direct attach cable, SFP+ cable on May 27, 2014 by Admin.